The Department of Energy won't hold the Solar Decathlon next year as originally scheduled and plans to have more industry "engagement" during a future event, according to Department of Energy officials and an internal DOE document. Instead, the plan is to hold the solar competition in 2020 and have participation from more universities and a "greater emphasis on innovation," the DOE document states. Yesterday, a DOE source said there were discussions to possibly change the event's name or focus, since solar is just one of the things competitors are judged on. Competitors typically are assessed according to water efficiency of their designs and other factors. "The rules of the competition might change," said the source, who was not authorized to speak to the press. The Solar Decathlon is a collegiate contest where teams design and build solar-powered homes. It has occurred every other year since 2005, with the last event held in Denver in 2017. It previously was held on the National Mall, and concluded with the selection of an overall winner "that best blends design excellence and smart energy production with innovation, market potential, and energy and water efficiency." DOE maintains a database tracking how homes from previous decathlons are being used. The current plan is to hold a call for competition designs this fall, followed by a selection of finalists and award funding in spring 2019 and a "public and industry tradeshow" with selection of the overall winner in 2020, according to the memo. The timeline is not likely to change much, one source said. The agency is also weighing having industry pitch in financially in terms of sponsorship. The internal document states that one of the objectives will be more "transfer of innovation" to industry in conjunction with the event. There are still plans to have a public event where home designs are on display. The agency said in February it was not issuing a funding announcement "in the near future" for the solar competition. At the time, DOE said it was not canceling the decathlon but did not make a formal announcement about changes. Since then, DOE has quietly updated some webpages and referred in newsletters to "Solar Decathlon 2020." A DOE official said in an email that the agency "is in the planning stages for Solar Decathlon 2020. We expect to have more information available this summer." Last year, the agency said it planned to hold the event in 2019. One former DOE contractor said the delay likely stemmed from the transition between administrations and all the vacant political slots at the department. Work was moving incredibly slowly after the Trump administration transitioned in as political appointees were coming up to speed, the source said. Earlier this year, DOE stopped calling its solar arm the SunShot Initiative as part of a push to broaden the office's focus beyond lowering solar costs (Greenwire, April 2). 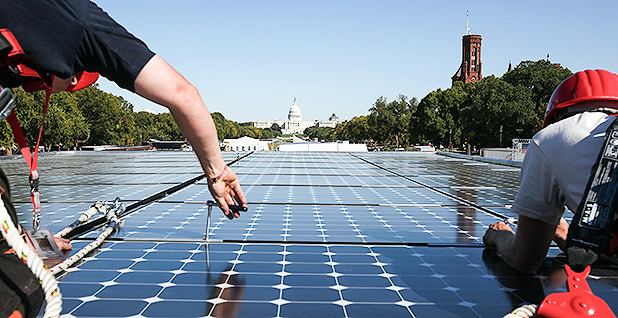 That prompted some critics to say the changes reflect White House attempts to minimize solar. DOE officials say that's not true, and that the administration is changing policies to reflect technology changes. The Trump administration proposed cutting funding to the Office of Energy Efficiency and Renewable Energy, which oversees the decathlon, by more than 60 percent. An energy and water appropriations bill moving through the House largely ignores the request and keeps funding flat. In fiscal 2018, Congress also ignored the proposed cuts and gave EERE a funding boost.